Engineers at the National Institute of Standards and Technology (NIST) needed a way to secure smart manufacturing systems using the digital thread , so they turned to the new kid on the block ... blockchain, that is. According to a new NIST report, the security system better known for underpinning Bitcoin and other digital currencies not only provides tamper-proof transmission of manufacturing data, it also yields something just as valuable to its users—traceability of that data to all participants in the production process. "Because blockchain gives us both capabilities, we can build trustworthiness into digital manufacturing networks," said NIST mechanical engineer Thomas Hedberg, one of the authors of the report. Blockchain, first used for Bitcoin a decade ago, is an expandable list of records, or blocks, that each contain data representing an individual transaction by members of a network. Each block consists of the data set, a time stamp, a cryptographic hash (an algorithm serving as a "cybersecurity fingerprint") and the hash of the previous block to mathematically link the two together. Therefore, each block in the chain is connected to the one after, the one before and all the way back to the original transaction (known as the genesis block). This means that the information contained in any block cannot be altered without changing all subsequent blocks and alerting the record-keepers in the network that foul play has occurred. 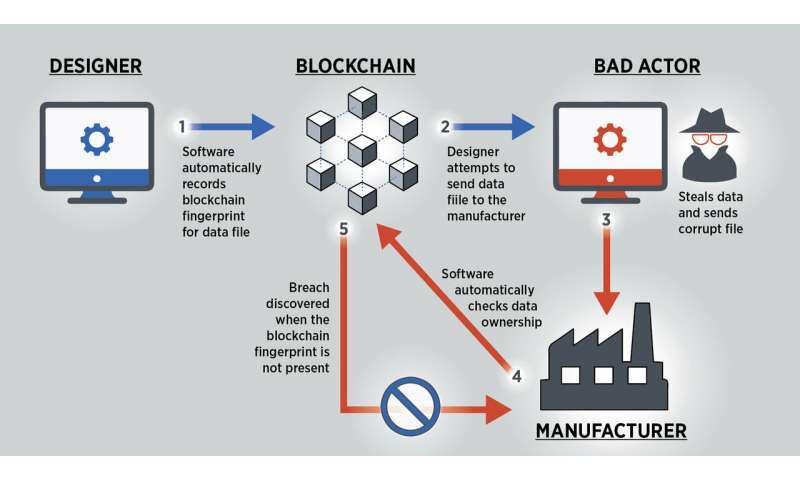 To further illustrate blockchain's value to smart manufacturing, a second NIST report features case studies from three different industrial sectors—additive manufacturing, autonomous vehicles and pharmaceutical—showing how the cybersecurity and traceability system would work for each.